In this leaf from a Gospel book, Saint John sits surrounded by his writing implements as he composes his Gospel text. The abstract treatment of the composition, with its emphasis on geometric shape and pattern, is characteristic of Ethiopian art of the period. Christian style and iconography began to appear in Ethiopian visual arts in the sixth century. Greek texts of the Gospels were brought to Ethiopia and copied into Ge'ez, the liturgical language of the Ethiopian church that appears on this leaf. The greater part of Ethiopia's Christian art was destroyed during the invasions of Islamic armies from the 1520s until around 1600. 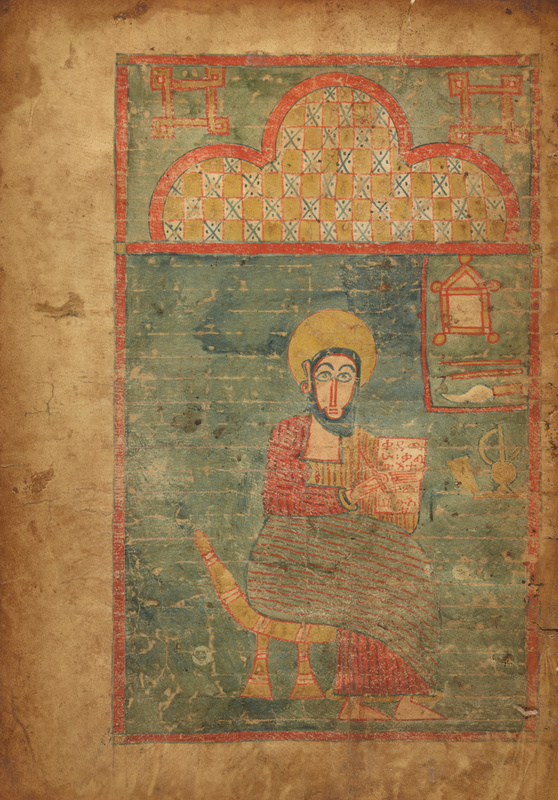 There are only about thirteen whole illuminated Christian manuscripts created before the sixteenth century that have been identified at this time, so this leaf represents a rare early example of Ethiopian Christian art.